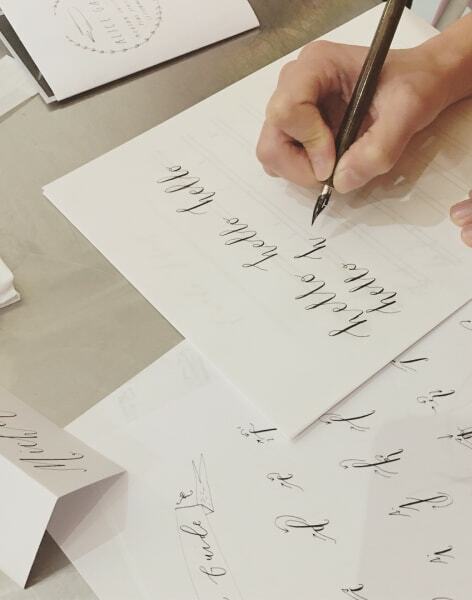 Learn modern calligraphy with Alice Gabb at Pearl & Groove. Whether you are writing wedding or other invites, this is the perfect way to start. In this workshop Come and join Alice Gabb and learn Modern Calligraphy in a glorious little café and bakery on Portobello Road, Notting Hill. You'll be welcomed with a cup of tea while Alice introduces the class with a bit of nib knowledge. This is a beginner's workshop, starting from scratch, with some practice exercises, then we'll move on to how to replicate Alice's signature lettering style. We pause in the middle for a freshly baked sweet treat to keep you going! By the end of the session you will be able to write your name or a favourite quote. 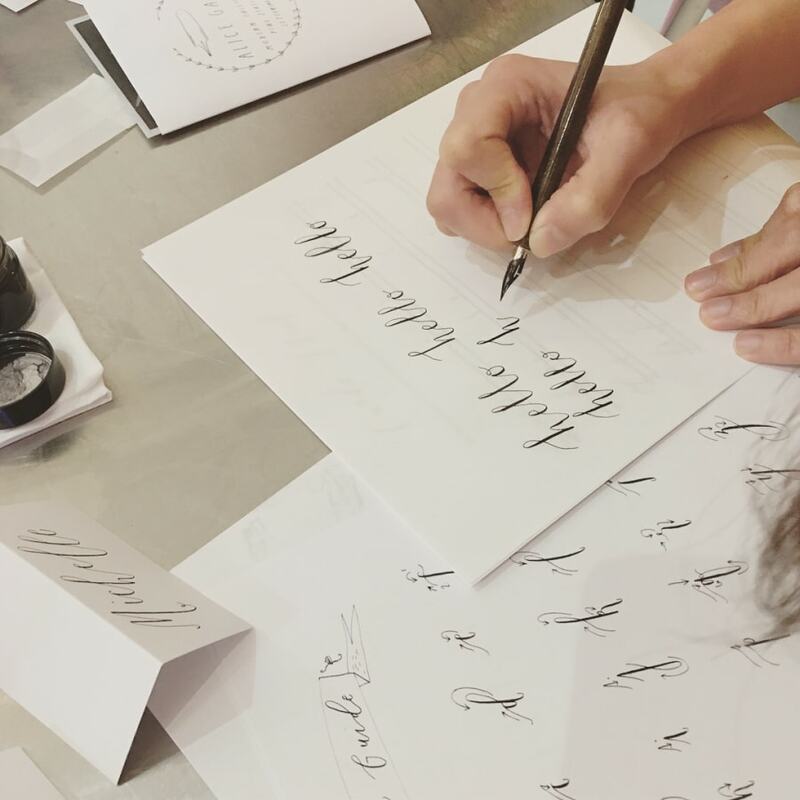 You will receive a full calligraphy kit to use during the class and take home with you, and have plenty of help from Alice and her wealth of trusty tricks and tips. Alice even provides her 'Master List' of favourite stores to give you plenty of inspiration. All in a fabulous setting! Workshops with Alice Gabb sell out super quick...workshops with Pearl & Groove sell out super quick...workshops with free tea and cakes sell out super quick...you can obviously see where we are going with this - book now to avoid missing out! Being a splendid Modern Calligrapher has nothing to do with having good hand writing, there's still hope! My first Obby & first calligraphy class. It was great fun, feel like I have learnt a new skill. Can’t wait to have a go at home! The venue is brill and Alice is lovely. Alice was thorough and patient. I would have liked to do more joint up writing so I could understand how the letter formations work in actual words as we predominantly focused on practising individual letters.But all in all - lovely atmosphere, with scrummy cake! Fabulous workshop in a great venue. Alice was the most generous teacher with a great smile and enormous talent and Pearl and Groove was a welcoming and delicious place to be. Practice makes perfect though, so we also received a canvas bag of goodies. Alice was so lovely and helpful! Really helped improved my technique for my future practice! This is a perfect beginners course Alice was super nice, helpful and fun. 55 pounds isn't cheap, but I think it was worth it as we got to keep the material and it was very personal teaching as there were only 9 people per class. The almost bottomless Pimms and delicious cupcake were a nice extra! I really enjoyed this calligraphy class. Alice was patient and informative, and the two hours just flew by! My only criticism is that although the cakes looked lovely, all varieties contained nuts so unfortunately I was unable to try one. Overall though a great class! I always wanted to learn calligraphy.! And Alice was perfect as a teacher. The fact that she was so patient and always leaning over your shoulder and trying to correct you when needed and giving you a few words of encouragement every now and then was amazing. The place and cakes were amazing! Alice was brilliant! No stuffiness or pretentious air. She clearly genuinely loves calligraphy! Everything was explained clearly and we found Alice extremely approachable, patient and kind. She was also very prompt at replying to any emails I sent in the run up to the workshop. Thank you Alice! I could not have enjoyed myself more. Not only was Alice an experienced and professional guide, she also built a relaxed environment that meant we all had so much fun. I could not compliment this class more. I hope that she releases additional levels as I will be practising at home and can't wait to learn more! Really fab evening with Alice Gabb - she was so helpful and lovely. A great 2 hour crash course in modern calligraphy! Loved doing the class with Alice. She was great! The Pearl and Grove was such a perfect space for the class. Can't wait to go back! Alice was a fantastic teacher and the bakery was a lovely setting for the workshop. Alice was really friendly and helpful throughout. Tasty cakes too! Great class! Really learnt a lot and received a lovely goody bag. not to mention a glass of Prosecco and a free cake in a beautiful venue. Alice was fab - would love to do this again! I really enjoyed the Modern Calligraphy workshop. The tutor, Alice Gabb, was excellent and we learnt the basic principles within the two hour session. It was also nice to get a goody bag and a basic calligraphy kit to take home. The glass of Prosecco and delicious cake helped too! I would definitely recommend this course to anyone looking to learn a new creative skill. Obby had me at "Calligraphy, Cakes and Prosecco" and the evening itself more than lived up to expectations. Fun, challenging and creative way to spend an evening. The venue is super sweet (I'll be back for the cakes alone!) and Alice was such a delight and so helpful. Determined to pick up my nib and keep learning! The workshop was brilliant. Alice was fun, encouraging and very patient. Amazing how much we covered in two hours. Really enjoyed it. A fantastic session - so relaxed and Alice is a great teacher. Tea and cake was an added bonus! Highly recommend. Really enjoyable and as it was a small group got lots of help and feedback from Alice. Pearl and Groove was a lovely place to have the class and the cakes were so tasty!! What a lovely evening! I am a novice to modern calligraphy and I enjoyed very much the 2-hour workshop at Pearl & Groove. 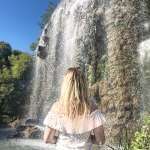 Alice is such a delightful teacher who shares her passion and guides us through the basics in a very relaxed atmosphere. She takes time for everyone in the class and makes each of us feel very comfortable. 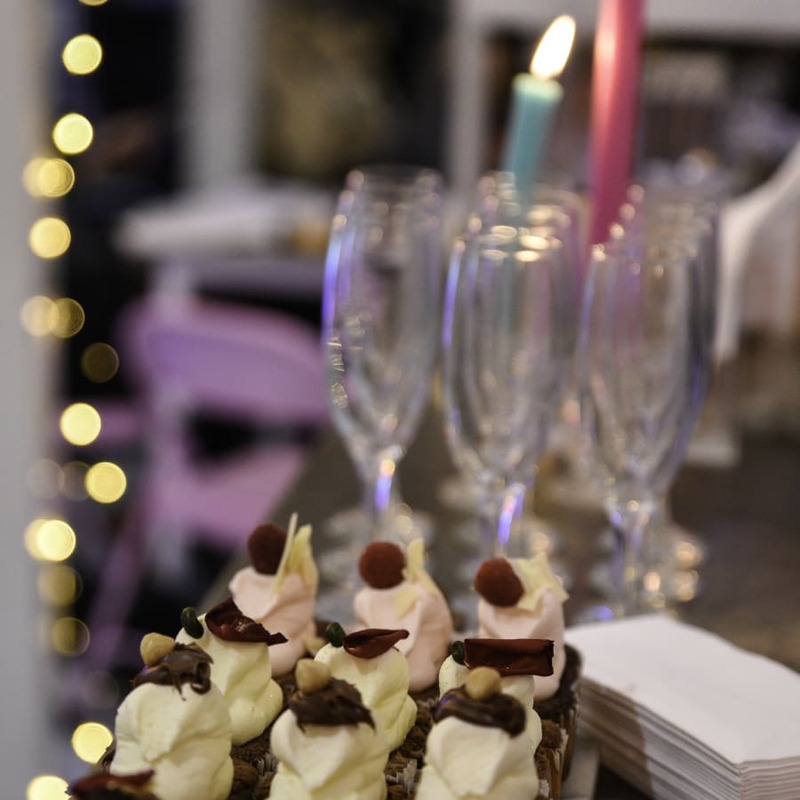 The beautiful cakes from Pearl & Groove are certainly a delicious bonus to a great evening that flew by! Thank you Alice! Pearl and Groove is a flourless bakery, founded by Serena in 2013, who named the company after her parents (you guessed it, Pearl and Groove!). All the cakes and treats are gluten free, and some are even sugar, dairy & gluten free. The ladies that run the shop are constantly getting creative in the kitchen and you will be hit by all sorts of delightful smells as you walk into the shop – so make sure to pop by some time. - Please bring plenty of patience and an eye for detail. The ink you will use is permanent so make sure not to come in your best outfit. (Sleeves and wrists in particular can be at risk of getting ink on them).Your booking includes all materials you will use in the class and you get to take them home with you afterwards!